Sarah Wetzel, poet and engineer, is the author of Bathsheba Transatlantic, which won the Philip Levine Prize for Poetry and was published in 2010. Sarah spent twenty years job-hopping across Europe and the Americas including seven years in Tel Aviv, Israel. 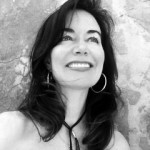 Despite an engineering degree from Georgia Tech and a MBA from UC Berkeley, Sarah completed an MFA from Bennington College in 2009. Her work appears in Israeli and American publications including Barrow Street, Valparaiso, Quiddity, Rattle, Pedestal, Stirring, Calyx, Nimrod, and others. She currently lives and works in Manhattan.